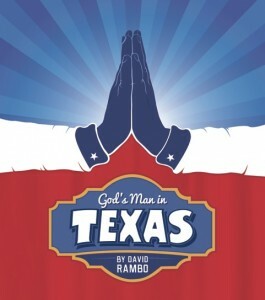 A new production of the comic drama God’s Man In Texas by David Rambo has been announced as a guest production at The Blank Theatre’s 2nd Stage in Hollywood. Directed by Rambo, the engagement will run four weeks only with previews on Thursday 8/13, Friday 8/14, and opening set for Saturday, 8/15 at 8pm. The cast will feature (in alphabetical order) Tom Costello, Ted Heyck, and Brian Letscher (currently seen as Secret Service Agent Tom Larsen on ABC-TV’s Scandal). Set design is by Chad Dellinger, lighting design is by Martha Carter, and sound design is by Tony Award-nominee Cricket Myers. The stage manager is Samantha Else. A comic drama about the struggle for power in a Houston mega-church, God’s Man In Texas was hailed at its Humana Festival debut as “the pick of the litter” in 1999. Over the following two years, it became one of the 10 most produced plays in the country, including productions at The Geffen Playhouse in Los Angeles and The Old Globe Theatre in San Diego. Playwright/Director David Rambo is the author of the plays The Lady With All The Answers (Off-Broadway starring Judith Ivey, Lortel Award nomination), The Ice-Breaker, Babbitt, an all new book for Lerner and Loewe’s Paint Your Wagon, The Lifeguard: Ronald Reagan and His Story, and God’s Man In Texas. His work has been widely produced at regional theatres throughout the country, including Actors Theatre of Louisville, Geffen Playhouse, The Old Globe, Denver Center Theatre, Alliance Theatre, and The Pasadena Playhouse. He has adapted several classic screenplays for live performance, including All About Eve, Casablanca, Adam’s Rib, and Sunset Boulevard, which was produced at the Hollywood Bowl with John Mauceri conducting Franz Waxman’s Oscar-winning score. Rambo has written and produced hundreds of hours of prime time television, including Empire, Revolution, V, and seven seasons of CSI: Crime Scene Investigation. There will be two preview performances of God’s Man In Texas on Thursday, August 13 at 8pm and Friday, August 14 at 8pm, and opening is set for Saturday, August 15 at 8pm. The regular running schedule will be Friday and Saturday at 8pm and Sunday at 2pm through September 5 only. Preview seats are $20 and seats for regular performances are $30. Tickets may be purchased online at godsmanintexas.bpt.me, or via phone by calling (800) 838-3006. The Blank’s 2nd Stage Theatre is located at 6500 Santa Monica Boulevard (at Wilcox), in Hollwyood, 90038.